At the South Padre Island Marathon, first time runners and experienced runners crossed the starting line together. or Parvaneh Moayedi, this would be her 810th marathon. She’s holds a Guinness Book of World Records Holder with the most marathons run in one year by a female (which has yet to be broken). Between November 2012 and November 2013, she ran 168 marathons. Parvaneh began her attempt on November 11 2012 at the Rock ‘n’ Roll San Antonio Marathon in San Antonio, Texas, and completed the 168th marathon at the Fort Worth Marathon in Fort Worth, on November 10th 2013. Now, she’s on track for another incredible milestone, complete 1000 marathons by the end of 2016. Does she run injured? ABSOLUTELY! At the South Padre Island Marathon she was running with a broken foot. The night before she had a medical boot on her foot but on race morning, that boot stayed in the hotel room. 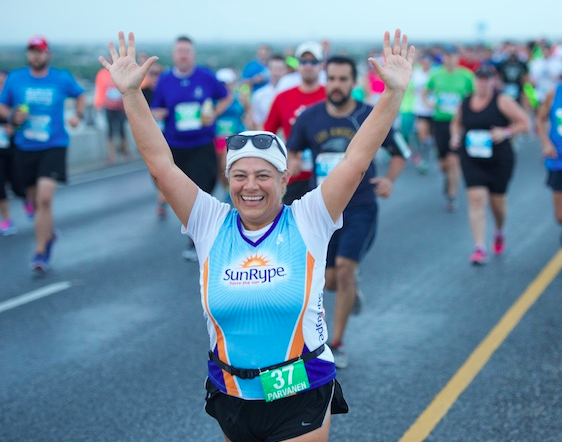 The South Padre Island Marathon was honored to have had such an incredible woman be a part of our inaugural run and hopes to have Parvaneh runs again in 2016. Her goal is to complete 1000 marathons by the end of this calendar year.